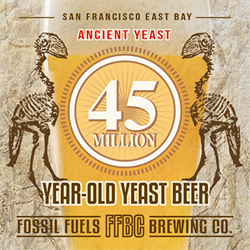 Fossil Fuels Saison, a 45-Million-Year-Old yeast beer, is scheduled for a limited-access December 2016 launch via an Indiegogo crowdfunding campaign. The brewers, Fossil Fuels Brewing Company and Schubros Brewery, are offering 1st Edition signed bottles to early backers. He isolated viable yeast. Yeast which eat barley and wheat sugars. Yeast which produce CO2 and alcohol. In short, the World’s most ancient Brewing Yeast. Fossil Fuels Saison, an ale made with 45-million-year-old-yeast recovered from Burmese amber back in 1992, will launch via an Indiegogo campaign on July 9th, 2016. The campaign, representing the capstone of a 24-year-long recipe and yeast development project, aims to place First Edition Bottles into the hands of campaign supporters as early as December, 2016. General market launch is scheduled for March/April 2017. The beer is a collaborative initiative between Fossil Fuels Brewing Company and Schubros Brewery. Fossil Fuels has been brewing (and drinking) small test-size batches of this since 2007. “So it’s just as safe as any other beer,” Lambert assures. “This is only the beginning,” adds Ian Schuster, CEO of Schubros Brewery. “This yeast is fantastic with a wide range of styles, the Saison being just the beginning. In fact, Raul has actually managed to isolate another two types of ancient brewer’s yeast as well. So there's a lot more excitement coming. “But first steps first. The research and development process is never cheap. Add in the complexity of an ancient organism that doesn’t behave like modern yeast, and it’s a major undertaking. Very capital-intensive, and tough for a small brewery -- hence the Indiegogo campaign,” continued Schuster. The campaign, which will go live July 9th, will offer an array of gifts to its supporters ranging from a private newsletter, to stickers, beer-soap, Launch Gala invites in San Francisco, and of course the ability to secure bottles up to 4 months before it goes to market. The campaign can be accessed here as of July 9th: https://www.igg.me/at/fossilfuels . “We decided to turn to the public for support because we need to get this right the first time. This is a yeast that requires very special handling, and it’s not exactly easy to get back to the Myanmar rainforests if we ever need to start from scratch,” stated Dr. Cano. No equity is available through this campaign. Equity is available for SEC Accredited Investors via other means, but interested persons would need to visit http://www.schubrosbrewery.com/investors/ for more information.